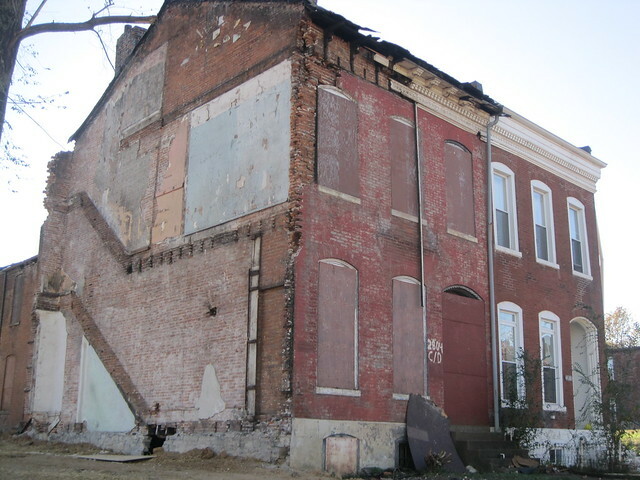 In September, I wrote about the storm-damaged collapsing eastern house in a row of three historic houses on the 2800 block of Lafayette Avenue (see “Rowhouse on Lafayette Avenue Slated for Demolition”, September 10). The Building Division quickly condemned for demolition the 19th century house as an emergency public safety hazard, and demolition commenced last month. The result shows the pitfalls of our current policy for abandoned buildings. There is no mistake that the wreckers hired by the Building Division did their job, but that job itself is not all that needed to be done. What is left behind by the crew an adjacent row house now weakened to a point where it too may start suffering structural problems. The first problem is that the side wall, of soft brick never meant to be exposed to weather, is now uncovered. On the front elevation, as I predicted, the wreckers could not easily deal with the fact that the front wall of the row was laid as a continuous bond with no easy seams. The wrecking job led to loss of face brick and of part of the wooden cornice of the neighboring house. The loss of the cornice is inexcusable since a simple straight saw cut could have been used. Again, I am not insinuating that the wreckers did anything wrong. Trouble is, they did what the city hired them to do. 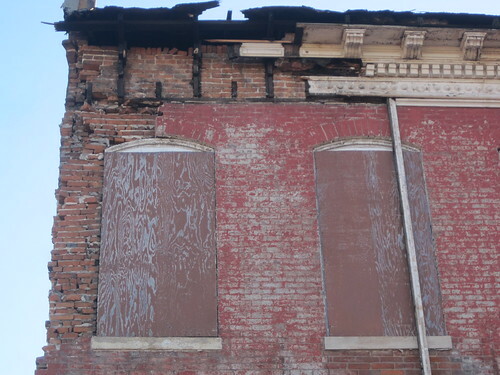 The city did not hire them to make sure the neighboring building was stabilized, or to do anything beyond removing 2804 Lafayette Avenue. That task seems particularly short-sighted when one views the newly-exposed east elevation to find a gaping hole in the foundation wall. I have no clue how this hole was created, but I do know that it leaves wooden joists unsupported. Without support, those joists will eventually fall, and pull the walls downward with them. 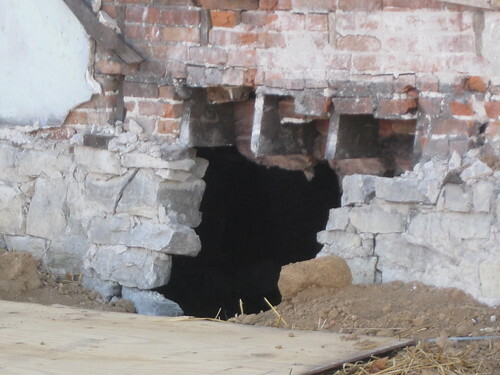 This hole should be patched in with masonry of either stone or concrete masonry units, but if anyone complains the most likely result will be that a city crew will cover it with plywood. Clearly, the Building Division’s demolition policy leaves unresolved issues when one building in a row — and despite perceptions there are many row houses in the city — gets wrecked but the row stands. The neighboring house now has been destabilized and joist collapse, front wall spalling and other maladies will set in. Hopefully if it gets demolished, the occupied house next door will be protected from careless damage. 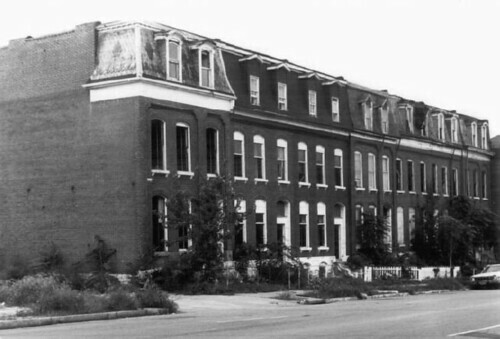 Photograph by Jane Porter of Landmarks Association of St. Louis from the National Register nomination of the Barr Branch Library Historic District, 1981. Today Barr’s Block has been rehabilitated again, reverting to town houses from its previous incarnation as rental housing. While Lafayette Avenue in the Gate District may have lost building density and be marred by much vacant land, there remain many historic buildings and the potential for urban infill. The location is amazing. Why the row to the west — not part of any historic district — has been left to die is incomprehensible. This entry was posted in Demolition, Gate District, Historic Preservation, South St. Louis. Bookmark the permalink. There needs to be some emergency City fund or private funds that can do a quick repair of that foundation (even as a stop-gap measure) to solidify that lower wall somewhat and lay a few bricks up top. This a real problem and if I was the owner of the house two doors down, I would repair it myself with my own money. Sorry, next door neighbor, not two doors down. It’s even more pressing for that adjacent house! Stupid, lazy and irresponsible. I wonder if the City and the demo company realize that they could be held culpable for any damage to the remaining occupied house on this row. I’m not one of those douches with “esquire” after my name, but the present situation isn’t ideal, to say the least. The unsecured and unstable foundation could afford any number of unscrupulous people entrance to this building. Arson, theft (though probably not any thing left to steal) and, of course, the continued deterioration of structure are all possible or probable outcomes. If I owned the occupied house, I would sue. Which is ironic, since it may be possible that the actions of that individual with regards to the demo’d house caused it to be razed. I walked by this building often on my way to Soulard Market. Always thought it would be saved given it’s in such a vibrant area which seems to greatly value preservation. Lafayette Square could have directed their fence expansion money towards stabilizing this house. Did they have any booths raising funds during their many events in the park? It seems the affluent neighborhood has greater responsibility given they neglected the building. 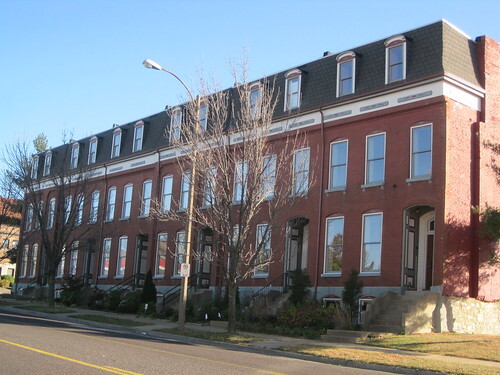 It’s not as if Lafayette Square has so many vacant buildings they are unable to act! Agreed Douglas. The surrounding neighborhood needs to step up too. If you had a booth asking for small donations at local events and asked for volunteer workers to do minor/moderate emergency repairs, that did not call for (heavy) equipment, you would be surprised how many folks would want to help a good cause. the tax credits for one. I’m with Douglass too. It surprises me Lafayette Sq doesn’t have more of a fierce historical society. I don’t quite get it either, I can’t speak first-hand anymore because the few folks I knew that renovated houses there in the 1980’s have long since sold them, maybe the first wave of rehabbers have all left. BUT it speaks to a larger issues of neighbors needing to get involved with their neighborhood (everywhere in STL). You mentioned something to the effect that “soft brick is never meant to be exposed to the elements.” What if your house is made entirely of soft brick? What do you do then? BTW, I’m being serious, as my house is soft brick and sometimes when it rains it “bleeds” red onto the mortar in certian areas. Visiting your site is Remarkable.